Go to our EARA Travel Tab to read article. Eastern has always been an airline of “firsts” and the radio show is carrying on that tradition and Legacy. Each show that goes into our EAL Radio Broadcast archives tells the hosts, that Eastern people enjoy talking and hearing about the “old” and the “new” as we like to think of our beloved Eastern Airlines. We discuss Airline History, Stories, News, Aircrafts, Airline Humor and even Airline Commercials to approximately 1000 listeners. Our broadcast schedule is every Monday from 7:00 P. M. until 8:00 P. M. ET. Hosts from six different locations discuss items pertaining to Eastern and its many valued employees and its 7300 EARA members located around the world. Each Broadcast is taped and you can easily catch the show by clicking on our archived files by following the directions below in red. We want you to tell us what you want to hear, suggest special "Eastern" guests, or tell us your favorite Eastern experience. This Radio Show is for and about the people of Eastern. Here's how it works! Tune in at our regular scheduled time, 7:00 P. M. EDT by calling: 213-816-1611 to talk to our hosts or by going to: www.blogtalkradio.com/capteddie. At the Blog Talk website: Click the button for the live sounds of Eastern Airlines. You'll recognize the familiar "Fly Eastern" theme music. We'll have plenty of Eastern's beautiful music played during breaks in the broadcast. You may use the Player above by clicking anywhere on it to take you to that website to start the show or URL: http://www.blogtalkradio.com/capteddie. Every Thursday there is a 3:30 P.M. EDT Program. Follow the same directions. From The Eastern Files,Thursday at 3:30 P. M. EDT and, every other Thursday: "Old Time Radio Show" at the same time 3:30 P. M. EDT. Join us for fun! The EAL Radio Show presents Episode 410, April 22, 2019 at 7:00 P.M. EDT with "The Big Three, MIA, ATL & JFK" and Neal will outline our The Big Three. America is home to many Int'l airports from JFK in NYC to Hartsfield-Jackson in ATL to MIA in Miami, FL. These airports serve as main hubs for big carriers. The bigger airports tend to have the most direct Int'l. and domestic flight routes, which make it faster and more convenient to travel. Plus, they're usually more affordable compared to flying through small regional airports—meaning worth braving the crowds. Let's take a quick look. John F. Kennedy Int'l Airport, NYC (JFK) formerly Idlewild is the main airport for NYC. Sees arrivals and departures from almost every Int'l airline in the world. JFK handles most Int'l flights while LaGuardia Int"l (LGA) also in Queens, is more popular for domestic flights. Newark Int'l. Airport (EWR) NJ handles both domestic and international flights. It's a bit further from the city than the other two airports, but less crowded and has more modern facilities. Join us to hear more by calling in Episode 410, Monday, April 22, 2019 at 7:00 P. M. EDT for a great topic "The Big Three, MIA, ATL & JFK" as we depart the gate. Listen in by clicking the hyperlink to take you to: www.blogtalkradio.com/capteddie. The EAL Radio Show for Episode 411 on Monday, April 29, 2019 at 7:00 P.M. EDT presents Eastern's Mexico and Cinco de Mayo. Usually this Holiday takes place on the fifth of May, as this is the date the holiday is celebrated. The Mexican army’s 1862 victory over France at the Battle of Puebla during the Franco-Mexican War was on this date, though it is a relatively minor holiday in Mexico. However, in the United States Cinco de Mayo has evolved into a commemoration of Mexican culture and heritage, particularly in areas with large Mexican-American populations. Eastern had the Mexico Silver Sleeper (DST) that flew on the Mexico route and in June 1956 at the time of the acquisition with a Canadian airlines, Eastern Airlines diversified into Mexico. On July 23, 1957, it began a New York-New Orleans-Mexico City service using DC-7 aircraft though in terms of its fleet, Eastern was quick to adopt jet planes. In April 1957 the first of 12 Convair 440s arrived with service into Mexico City. Join us to hear more of Eastern in Mexico and Cinco deMayo by calling 213-816-1611 on April 29, 2019 at 7:00 P. M. EDT as we depart the gate. Listen in by clicking the hyperlink to take you to: www.blogtalkradio.com/capteddie. The EAL Radio Show presents Episodes 412, May 6, 2019 at 7:00 P.M. EDT with an episode very dear to our Eastern Pilots. 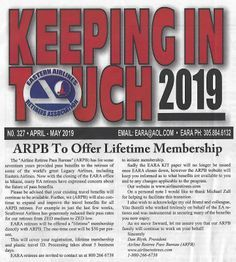 The Retired Eastern Pilots Association (REPA) began their magazine Newsletter "REPArtee" in 1977. REPArtee was started to introduce the Association and all their efforts. We will hear more of the contents of this magazine and the efforts being made to continue this magazine. It is our good fortunate to have both the former REPArtee Editor, Captain Neal and the current REPArtee Editor, Captain Jim with us for this program. Eastern Captain Bill Malone was “REPA” Editor for 15-years and had his spin of many changes to the magazine. Upon his retirement, our own Captain Neal Holland became Editor of “REPArtee, from 2000-2003 and Neal, too, made his significant changes. He instituted 3 issues per year of the REPArtee magazine and is known for the change of binding of the REPArtee from Saddle Stitching to Bound, started the REPA Memorials, and began the REPA website. Captain Neal then turned the reins as Editor of REPArtee over to Captain Jim Holder and Jim has continued as Editor to produce this wonderful magazine and the REPA website. He too made his significant changes, one being the inclusion of the Memorials for all their fallen Pilots placed on their website and in the issues. Join us to hear more by calling in May 6, 2019 at 213-816-1611 at 7:00 P. M. EDT as we depart the gate. Listen in by clicking the hyperlink to take you to: www.blogtalkradio.com/capteddie. 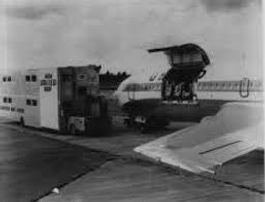 The EAL Radio Show presents another great memory of Eastern Air Cargo & History of Air Freight in Episode 411, May 13, 2019 at 7:00 P.M. Remember the Eastern Airlines 727QC aircraft, doesn't this photo bring back memories, especially to our Eastern Ramp & Air Freight employees? Neal will relay some of the history of how Colonial Airlines began in 1923 and later acquired the 1st domestic Air Mail Contract under the Kelly Act of 1925. Colonial then established a scheduled service between Boston Logan and New York several months after the start of the war and engaged in cargo operations for the Air Transport Command, somewhat similar to Eastern's Military Transport Division, with routes were from NY north and east through New England, and west to Chicago. Four days before the end of WWII, the CAB extended the route system to include N.Y to Ottawa and Washington to Montreal and Ottawa. Eight more intermediate stops were also authorized and service was inaugurated on Feb. 16, 1946. Colonial on April 25, 1946 was awarded the International routes from New York and Washington to Bermuda. Join us to hear Neal share more History by calling in on May 13, 2019 at 213-816-1611 at 7:00 P. M. EDT as we depart the gate. Listen in by clicking the hyperlink to take you to: www.blogtalkradio.com/capteddie. Eastern Rocking To The 60's, 70's and 80's! "More Music of the 70's"
The "Old Time Radio Show" program brings you Episode 22, in our series called "Eastern Rocking To The 60's, 70's and 80's"! So listen in on Thursday, April 18, 2019 at 3:30 P.M. EDT for Eastern Plays More of The 70's today, and reminisce with Captain Neal and your Host, Don Gagnon. Join us on Thursday, April 18, 2019 at our new time of 3:30 P. M. EDT to hear more great songs and some of our Eastern history during that time. Please go to the hyperlink above and click to go directly to our Blog Talk Provider, www.blogtalkradio.com/capteddie. The EAL Radio Show Episode 70, Thursday, April 25, 2019 of "From The Eastern Files" begins at 3:30 P.M. ET with another great story from our Eastern Files. Neal provides the Eastern family with memories of their days while working at Eastern and reads one of the chapters we knew while working there. Join us to hear one of our favorite Eastern memories that Neal will share with us. We air on Thursday, April 25, 2019 at 3:30 P.M. EDT. Listen in by going to our provider's website: www.blogtalkradio.com/capteddie. Thank You, we are truly proud to be “The Radio Voice of Eastern Airlines." Your Sponsorship Is Truly Accepted With Our Thanks! Our Website and Live Radio Broadcasts are supported by Donations. We appreciate your continued support of this Eastern EAL Radio Show as we carry on the memory. You may Donate by clicking the Donation Icon below. EAL Radio Show Broadcast "From The Eastern Files"